Welcome to the battle of the uber-hatches. 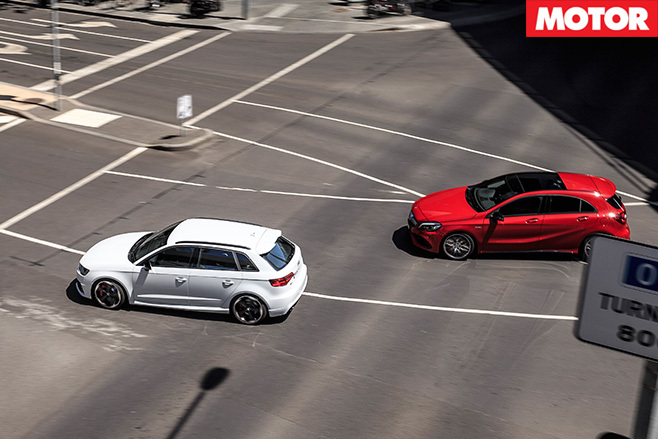 No, this doesn’t mean that either the Audi RS3 or Mercedes-AMG A45 will transport you home after a big night out with a tap of your smartphone. Instead, by offering supercar performance in a five-door body, they satisfy the true definition of uber: being a superlative example of its kind or class. As premium manufacturers push downwards into new, volume-selling segments, yet customers demand ever greater performance from the go-fast variants, the hot hatch arms race is accelerating as fast as the cars themselves. But this speed comes at a cost. 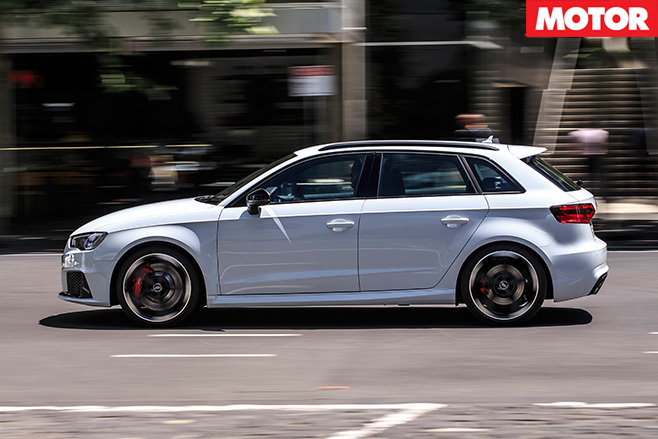 The as-tested price of our RS3 test car is a hefty $89,265. The $78,400 MRP swollen by $1495 for metallic paint (on an $80K car? ); $1600 for the extended black high gloss styling package; $780 for black roof rails; and $6490 for the RS Performance Package. And you can spend plenty more than that, including $4500 for RS bucket seats and $8990 for carbon-ceramic brakes. 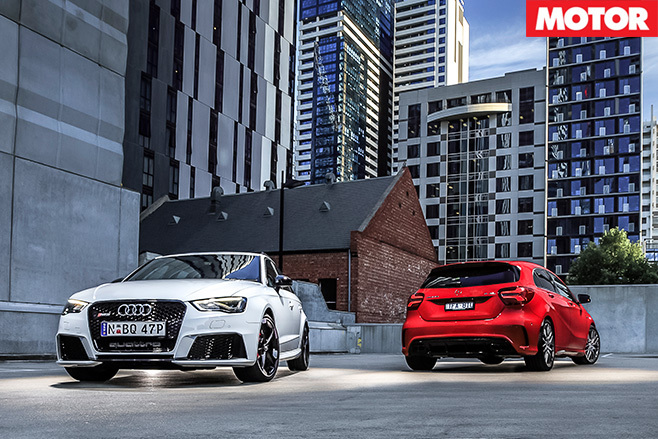 Neither of these – nor the external bling – is strictly necessary, but the RS Performance Package is a must-tick option, for reasons that will become clear later. Mercedes takes a more inclusive approach to pricing, the only option on our $77,900 A45 the $1990 Dynamic Plus package, which adds tyre pressure monitoring and the new mechanical front limited-slip differential. Aussie A45s come loaded with gear that’s optional overseas – metallic paint, climate control, sunroof, keyless entry-and-go, Recaro seats, leather, even the shift paddles – which gives it a handy $10K advantage before we even turn the keys. A45 pricing has risen by about $2000, however it’s all going to the government in the form of luxury car tax, as the new model’s fuel consumption has risen through the 7.0L/100km threshold to 7.3L/100km. Compensation for the hip pocket hit comes in the form of an extra 15kW/25Nm, the new A45 once again the hot-hatch kilowatt king with 280kW/475Nm. Which brings us to the business of those superlatives – these might be very expensive small cars, but they are also performance bargains. 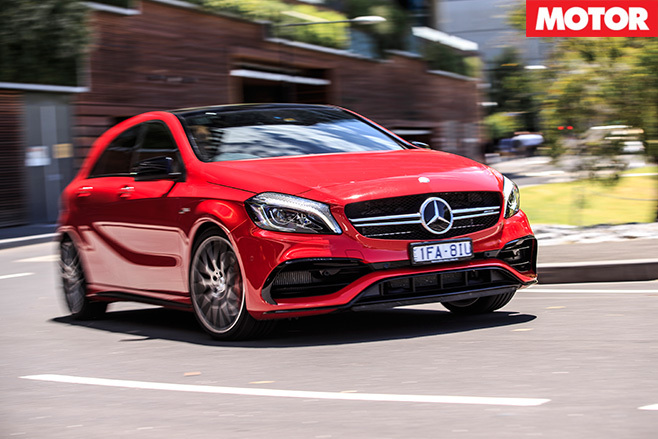 AMG claims the updated A45 can hit 100km/h in a ludicrous 4.2sec – that can’t be right, can it? That’s faster than an Audi R8 V8, a twin-turbo W12 Bentley Continental GT, or any Maserati. Activating the AMG’s launch control is a bit of a process: select RACE on the new Dynamic Select controller, select Manual for the transmission and press firmly with your left foot on the brake. Now pull both paddles back towards you until “Race Start” appears on the central instrument display; pull the right paddle to confirm, floor the accelerator and revs rise to just shy of 4000rpm, the engine stuttering against a temporary limiter. Lift off the brake and the A45 fires off the line, short-shifting into second and third despite the unbreachable traction offered by all-wheel drive. Do anything but sit there with your right foot welded to the carpet – lift slightly, change gear manually – and the program will cancel so there’s nothing to do but watch as 100km/h flashes up in 4.16sec and the quarter mile in 12.41sec at 180.23km/h. Conventional thinking would have you believe a 2.0-litre turbo four-cylinder producing this much grunt would be a laggy, top-end monster, but nothing could be further from the truth. It takes a moment to gather its breath – all 26psi of it – but the mid-range is massive and it feels utterly unstressed at high rpm. So unstressed that it’s easy to run into the 6700rpm limiter during hard driving, particularly as the new, slightly shorter gearing is a little awkward. On some roads you sometimes find yourself caught between two gears – usually third and fourth – and the seven-speed dual-clutch isn’t fond of delivering shifts in a timely manner. Downshifts especially are often delayed to the point where it’s better to just leave the ’box in Sport and work around it. Left alone like this it does a good job of selecting the right gear, but if the A45 has a weakness, it’s the transmission. 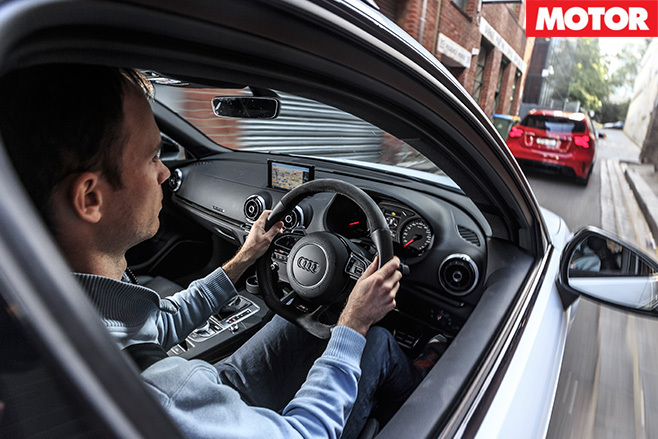 The RS3’s seven-speed dual-clutch is much slicker, with faster changes, more responsive shifts and longer ratios, which means you’re flicking paddles with less frequency. The only blot on its copybook is that manually changing from first-to-second under full throttle occasionally sends a fearsome shock through the whole car with a bang that sounds for all the world like the gearbox has just fallen through the floor. Thankfully, the sound that usually escapes the RS3 on upshifts is a vicious CRACK from the exhaust. Both these cars offer the full complement of artillery fire on the over-run, but the Audi is particularly vocal, sounding on occasion like it has anti-lag. While the A45 emits an angry mechanical buzz, the RS3 has the deep, bassy warble only five cylinders can provide. For rally fans, that note will act like an automotive Tardis, instantly transferring them 30 years back in time. Audi may have plonked an S1 badge on its hi-po supermini, but it’s the RS3 that best pays tribute to its famous WRC predecessors. One second you’re having a fang on your favourite twisty road, the next you’re Stig or Hannu attacking a Corsican special stage, swept away on a wave of nostalgia. And the RS3 doesn’t just sound like a Group B car, it goes like one, too. Activating launch control is a simpler process than in the Mercedes – select Dynamic, ESP in Sport, press the brake and floor the throttle – but it’s even more devastatingly effective, the Audi rocketing to 100km/h in just 3.95sec and through the quarter mile in 12.24sec at 181.13km/h. Its off-the-line punch is brutal, yet on the road the speed feels even more other-worldly. It charges down straights with relentless efficiency, not a single kilowatt wasted thanks to quattro traction. It’s an experience that can leave you breathless, so why is there a bright red Mercedes resolutely stuck to the RS3’s rear bumper, lights ablaze? It’s a good question, and switching to the A45 offers few clues. It’s undoubtedly quick, with especially strong brakes, but feels to have more understeer than the Audi, and any attempt at involving the rear is resolutely ignored. Switch back, however, and the picture becomes clearer. The Audi is more playful, but try and match the ultimate pace of the Mercedes and it begins to lose its composure. Mid-corner bumps that are summarily dispatched by the AMG’s excellent new adaptive dampers send the RS3’s optional magnetic dampers crashing into their bump stops. The trick suspension comes as part of the aforementioned RS Performance Package, which also brings with it wider 255mm front tyres (rears are 235mm). The extra front rubber helps, but ultimately fails to stop that big 2.5-litre five-pot slung ahead of the front axle from dragging the nose wide. Oddly, it feels better on track, stable and planted but with just enough adjustability to keep you entertained or allow you to adjust your line if you get it slightly wrong. Unusually for a road car, it rides Sandown’s high kerbs well and punches out of its tight corners with furious anger. Acceleration slows markedly over about 170km/h – blame that longer gearing – but its biggest downside on track is its brakes. Granted, Sandown has a couple of big stops, but after three laps they’re a soft, smoking mess and spend the rest of this test screeching and graunching at every stop. The hardware is impressive – 365mm discs with eight-piston calipers up front, 310mm discs and single-piston calipers at the rear – but anything with an RS badge on it should have more stamina than this. The A45’s stoppers also feel the heat on consecutive hot laps, however, after a short cool-down, recover quickly and are ready to go again. It stops so well the rear end finally starts to wander around under brakes, but from the moment you turn in, it relies heavily on its front end for purchase. The optional mechanical front diff means there is a very definite technique to extracting the best out of the AMG, and it’s tricky to nail. Carrying too much entry speed pushes the front wide and accelerating only increases the problem; the key seems to be to slow the car more than feels natural and exit squarer, but it’s a delicate balancing act. But it’s not. Despite the RS3 gaining time across the kerbs and feeling more fluid from behind the wheel, the A45 is eight-tenths faster, clocking 1:25.4 to the Audi’s 1:26.2. It neatly aligns with our findings on the road; the Audi feels faster, but it’s the Mercedes that’s delivering the goods. The only conclusion to make is the A45 reaches its limits with so much stability and so little drama that you’re actually going much faster than you realise. It’s a four-wheeled Terminator – a ruthless road-killing machine. And yet it’s at the other end of the spectrum that the biggest advances have been made. The addition of adaptive dampers has vastly improved the A45’s ride quality; there’s still an underlying firmness, and it can get a bit choppy on bad roads, but there’s a pliancy to the damping that neither its predecessor nor the RS3 can match. The Audi isn’t bad, but fidgets more than the A45 and there’s quite a lot of suspension noise, too, though its cabin is noticeably quieter in terms of tyre and wind noise. 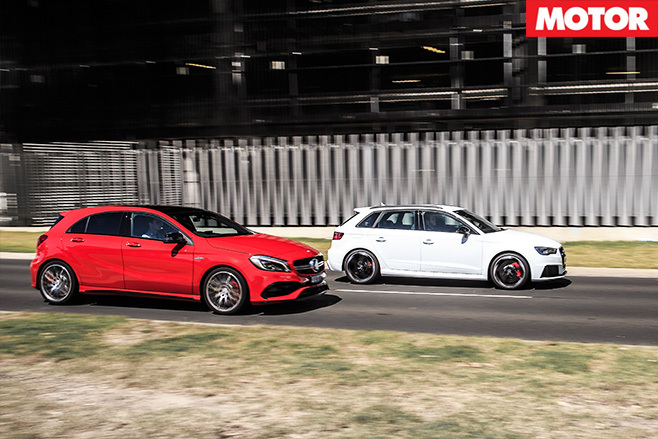 The Merc’s seats are superior in terms of lateral support, but can be wearing on longer trips, and it’s ergonomically not a match for the RS3. Throughout this comparison, the two combatants have traded blows like Foreman and Ali in the Thrilla in Manila, which makes picking a winner a tough task. The updated A45 is faster on road and track, and if you take away the RS3’s initial launch advantage, just as quick in a straight line. It’s also significantly cheaper, however it seems unlikely that fiscal considerations will play a large part in the purchasing decisions of those willing to drop $80K on a hot hatch. Instead they’ll want the best car, and that’s the Mercedes. It just feels more resolved and more thoroughly developed than the Audi. 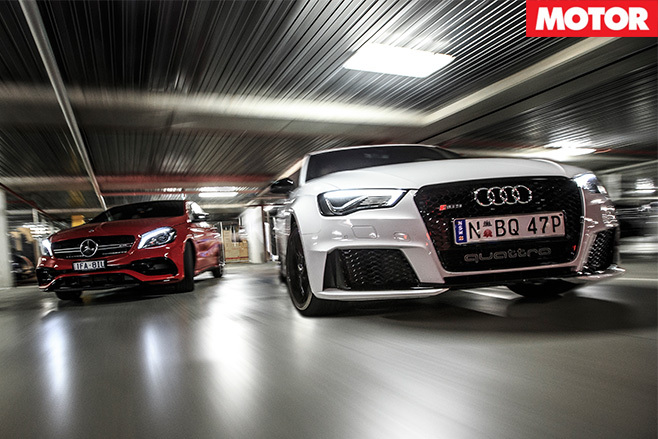 Why, then, did everybody who drove the two cars for this test come away preferring the RS3? Well, the incredible engine plays a big part, but it also makes you feel a bit more involved in the process of going fast. Both these cars are so quick and capable that it would take some very exotic machinery to stay with them in most circumstances, however the Audi has more of a sense of humour about it. 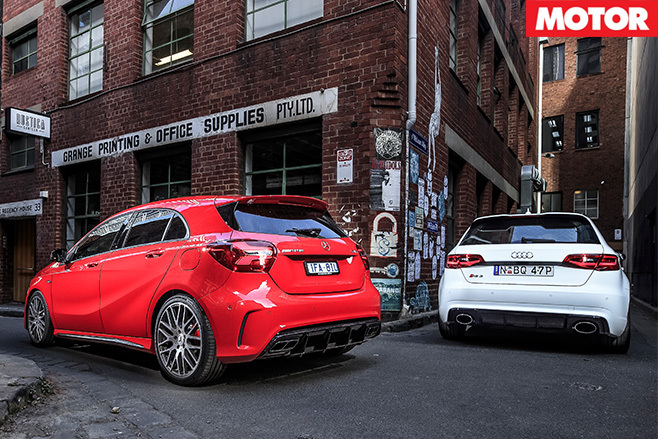 If you’re a hard driver who likes to hit the track, the A45 is for you. 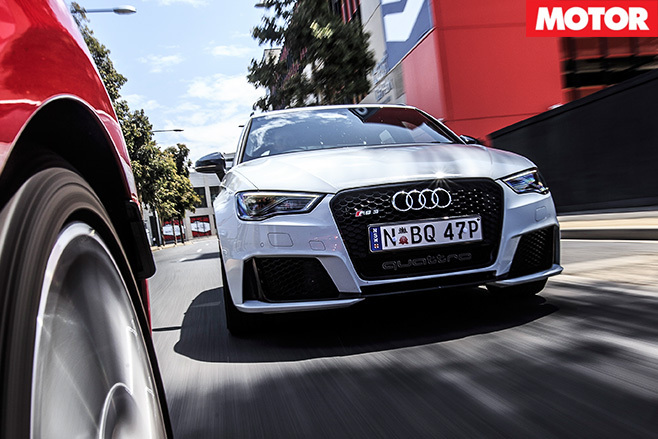 For day-to-day use, take the RS3. 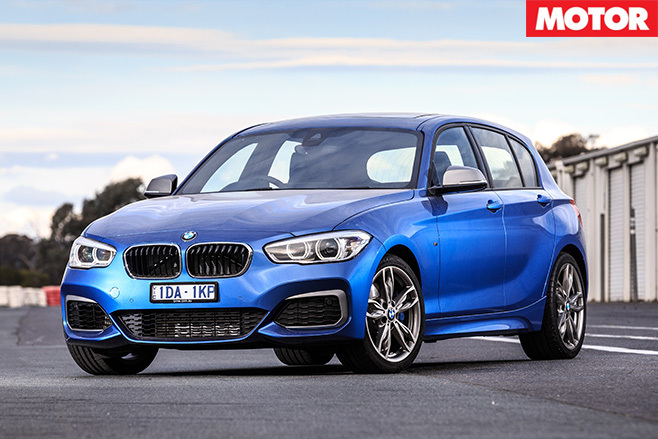 BMW’s M135i wasn’t included in this test, as at $62,900 it’s $15K less than a basic A45 or RS3. However, with one recently installed in the MOTOR garage, comparisons had to be drawn. It’s mildly outgunned in standard form, however spend the money saved on a light tune and the optional LSD and you have a car that would be every bit as fast in a straight line and more involving thanks to its rear-drive chassis. Some will enjoy the security offered by the all-wheel drive Audi and AMG, but Bimmer’s little blue bullet is worth a look. У нашей фирмы нужный портал со статьями про продвижение по ключевым словам.